Calamari is probably one of the most popular appetizers at restaurants. I know my friends and family almost always have an order if it’s available on the menu. That doesn’t mean that every order of calamari is equal in the mouth of the beholder. There are a variety of ways to make the dish. Some restaurants over-bread their calamari by using flour, eggs, and breadcrumbs. That’s a good way to ensure a crispy outside and that the calamari retains it’s shape without breading falling off. Nonetheless, that can often feel like the heavy breading is the star of the show while the calamari is a rubbery sidekick. Other restaurants sometimes barely bread the calamari at all, which highlights the squid, but can often mean soggy breading that just falls off as it’s plated. In this recipe, I took the middle ground and used a light breading, but also used milk or buttermilk to tenderize the calamari. This also allowed the breading to really adhere to the squid’s smooth surface. Marinating seafood in milk might sound strange, but it’s a great way to remove fishiness from items that may be frozen or less than fresh as well. The combination of using flour only and milk as a tenderizing binding agent really makes this dish rival some restaurant preparations. That means you too can have restaurant quality calamari at home! The other added benefit to the simple preparation is that the recipe is customizable because you can add your own spices to the flour or flavors to the marinade to change things up between batches. Fried Calamari with dipping sauces. Note: Rather than just relying on the buttermilk to have the flour adhere to the squid, you can also use two beaten eggs mixed with the calamari (obviously after draining the squid of milk or buttermilk). If you have fresh calamari, great. If not, make sure to let it defrost before you try to make this recipe. I won’t go over how to prep a squid into rings, so I’ll assume you already have calamari rings. 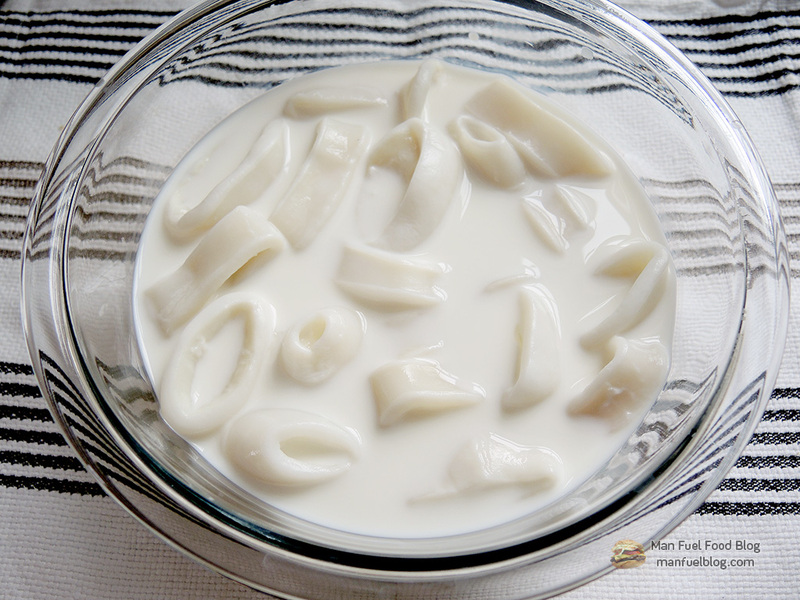 Take the calamari rings (and legs if you want), place them in a bowl, and cover with whole milk or buttermilk. This step not only helps to remove any fishiness often found in frozen calamari, but it helps to tenderize it so that it doesn’t get too rubbery during the cooking process. Let the calamari soak covered in the fridge for at least 4 hours or ideally overnight. Optional Step: If you want to flavor the milk/buttermilk to add a little something extra to the calamari, you can do that by adding two roughly chopped garlic cloves to the milk or any other flavor you think might complement the calamari. After the calamari is marinated, place a 1/2 cup of flour (or a mix of flour and corn flour or cornmeal) into a bowl and mix it together with the 1/2 teaspoon of baking powder (this helps to puff up the flour a bit and keep it crispy), the 1/8 teaspoon of salt, and the 1/8 teaspoon of black pepper. 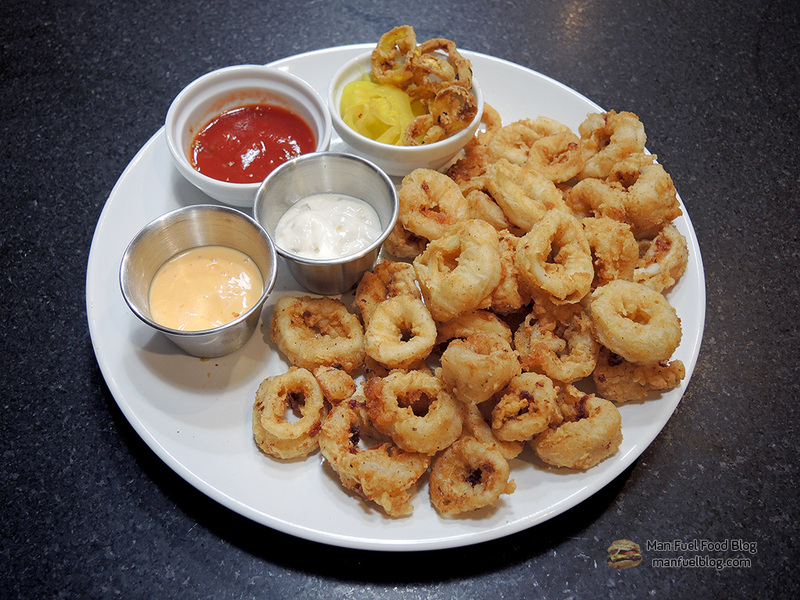 Optional Step: You can add other flavors to the flour to customize the calamari. Try adding 1 teaspoon of onion powder and a 1/2 teaspoon of paprika for some variety. You can add other flavors as well if you’re feeling particularly creative. Optional Step: You can bread the calamari using the moisture from the milk or buttermilk to have the flour adhere to the squid or you can also use eggs. The eggs really help to bind the flour and make the coating more uniform, but they also make the breading a touch heavier. If you want to use eggs, drain the milk or buttermilk from the squid and then mix two beaten eggs with the squid before moving on with the recipe. 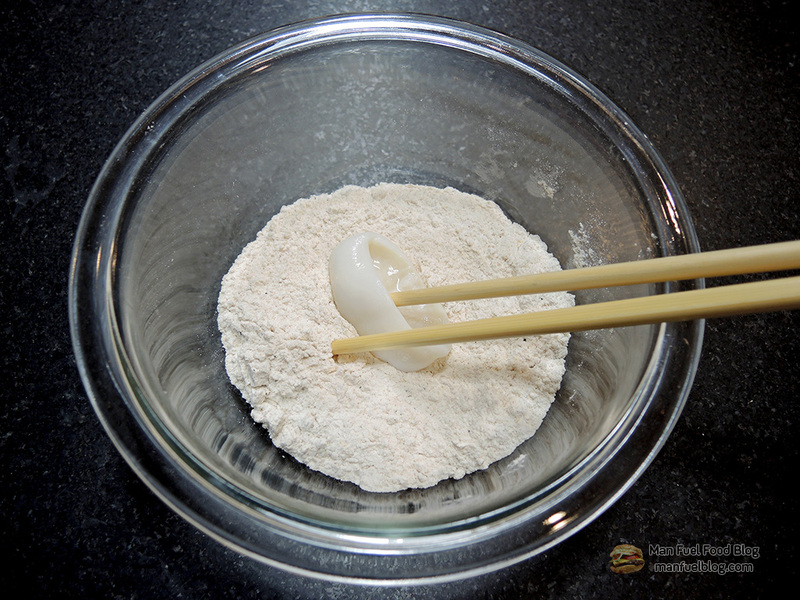 Use one fork or chopstick to transfer a couple of calamari rings right from the milk/buttermilk to the flour and use another fork or chopstick (a dry one that hasn’t touched the calamari) to dredge them in the flour. You can also use your hands if you want to dredge the calamari rings. The idea is to keep the wet utensils away from the flour to avoid clumping. 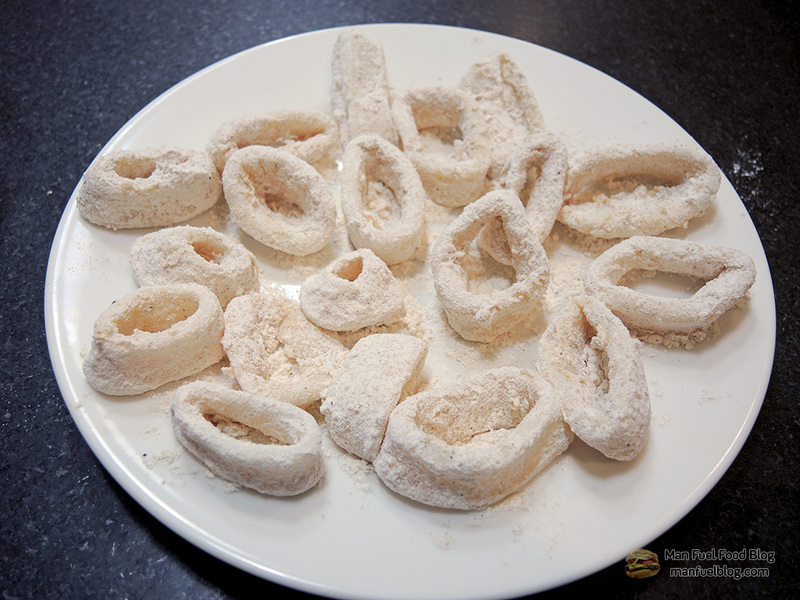 After dredging the calamari rings in the flour, transfer the calamari to a large plate or tray. Don’t let the pieces touch one another. Repeat this process for all of the calamari. If you don’t mind getting your hands dirty, then you can just use your hands to dredge the calamari. 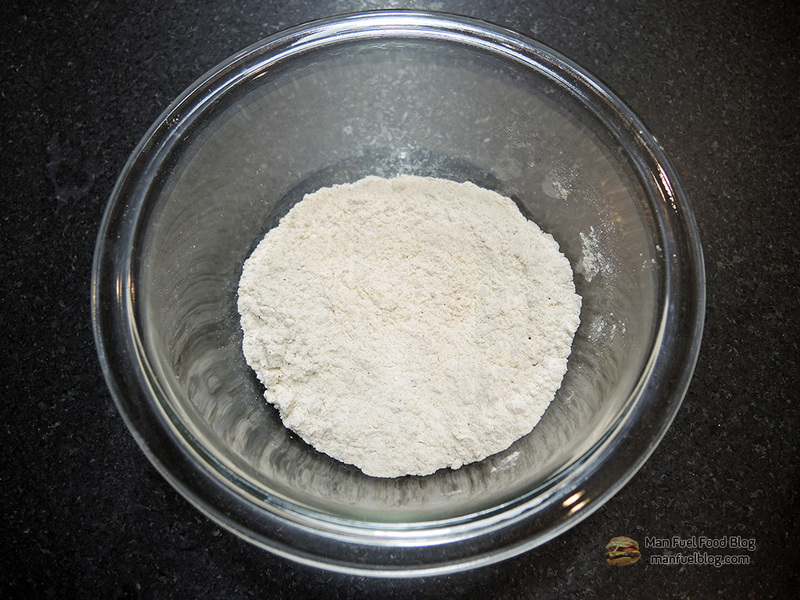 Use on hand to take the calamari and place it in the flour and use the other hand to move flour over it while dredging. That way one hand only touches the wet squid and the other only touches the flour covered squid. 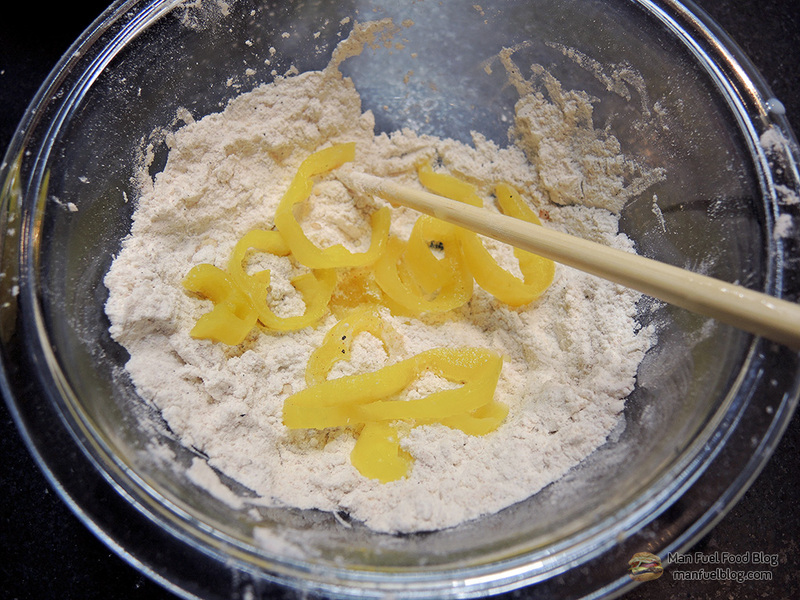 Optional Step: You can also dredge banana peppers in the flour to fry later. The pepper rings add a tangy and mildly spicy variety to the dish. You can mix them in with the calamari or keep them on the side. You don’t need to bread them either. You can leave them as they are and toss them with the fried calamari. You can also saute them with some olive oil and garlic to create a topping for the calamari. In some circles, this preparation of combining banana peppers with calamari is called Rhode Island-Style Calamari. With the calamari breaded, place enough canola or vegetable oil in a small pot or deep pan to have about an inch of depth. 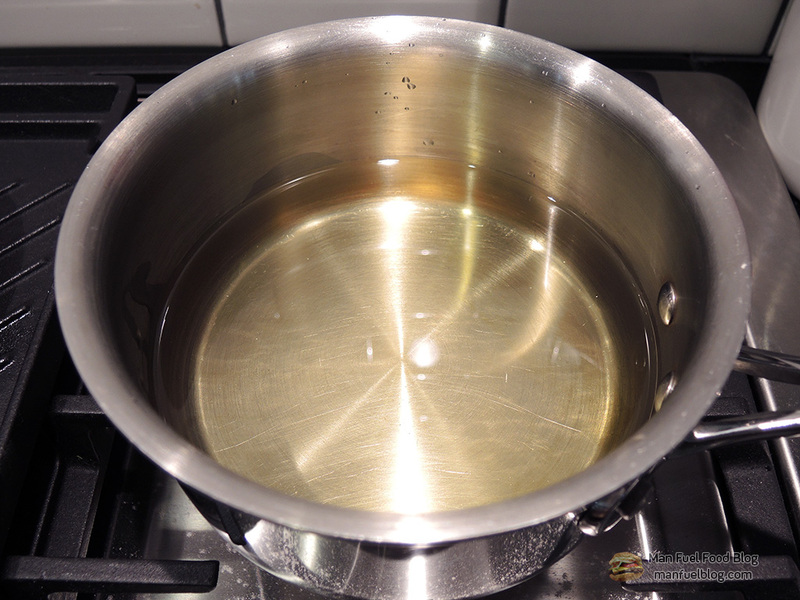 Heat the oil to 350 degrees F (that’s roughly the medium heat setting on a stove if you don’t have a thermometer). Once the oil is hot enough, add a few calamari to the oil to fry. If you don’t have a thermometer you can roughly tell when the oil is hot enough once you can see it shimmer a bit. If you place the end of a wooden spoon or chopstick into the oil and it bubbles, then it’s ready to go. It’s very important that you don’t overcrowd the pot or the calamari will steam and the breading will just get soggy. Just put a few at at time so that they don’t really touch. Let the calamari fry on one side for about three minutes. 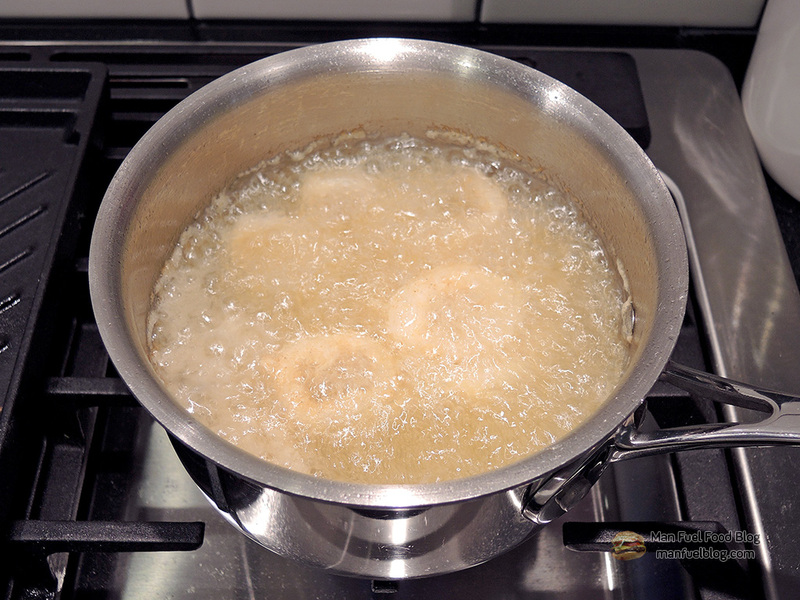 Then carefully flip them to finish frying for another 1-2 minutes. Watch the color of the breading. You’re shooting for golden or golden brown and crispy. If it gets too dark too fast, then the oil may be too hot. If it seems to just remain soggy or fall off the calamari after a couple of minutes, then the oil may be too cold. Use a slotted spoon or spider spatula to remove the calamari and place them either on a fine wire cooling rack (preferred) or a wide plate lined with some paper towels to absorb the excess oil. Repeat the process to fry all of the calamari. Between batches, you should try and skim out any noticeable burned pieces of breading that may still be in the oil. If you prepared the banana pepper rings, then fry them after the calamari the same way. Plate the calamari and serve along with your favorite dipping sauce. Some sauce suggestions are: marinara, tartar, creamy chipotle, remoulade, and hot sauce. 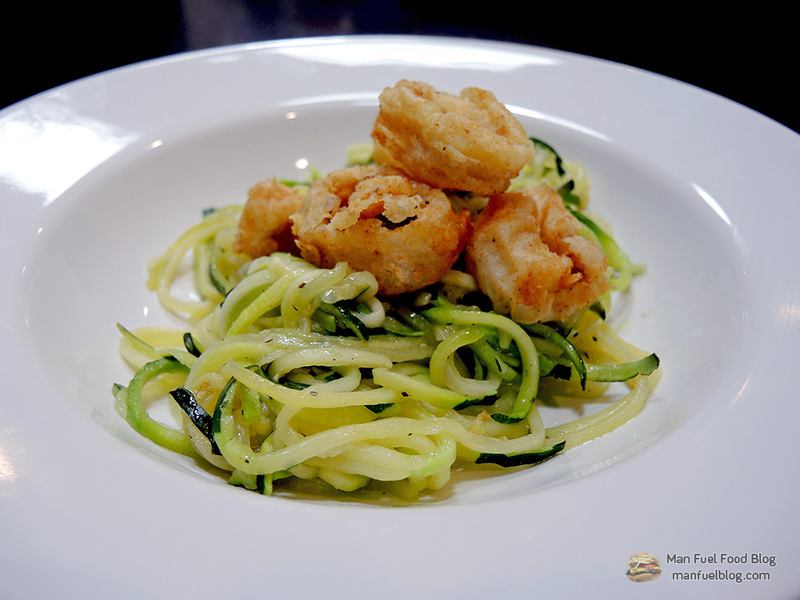 You can even use the calamari as a topper for other dishes like zoodles (spiralized zucchini noodles) sauteed in butter and garlic. As for the purists out there, you can try just a squeeze of fresh lemon on top of the calamari. Perfect. So easy to mess this up. Great job. Thanks! Often, simple is best. It is great, Freya! Thanks for stopping by! Wow, sounds so good. Think i will try with shrimp! Love seafood..memories of growing up on Northshore in MA. Hi Linda! If you try this with shrimp, definitely use some corn flour or cornmeal in the mix. It goes great with shrimp! Hope you enjoy!